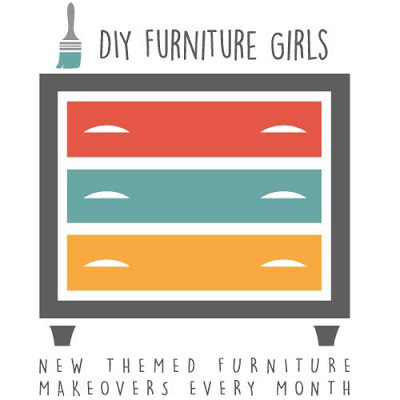 Welcome back to my favorite day of the month: Themed Furniture Makeover Day. 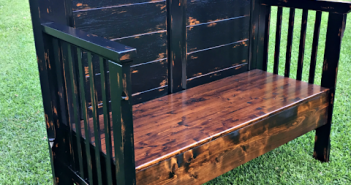 I have to admit, I have nothing in my home that resembles “farmhouse” so to try to come up with a farmhouse makeover kind of stumped me at first. Upon brainstorming along my way to dropping off kiddos at school I came to the realization that I drive by some beautiful little farmhouses every single day and decided to share one of my favorites with you. Built in 1892, it was once a family home, a hotel, a Christmas home tour and the scene of one of our town’s most talked about “miracles”. In the early 1900s, a young boy was bird hunting in a nearby field and accidentally shot himself in the abdomen while crawling through a fence. He was taken to the home and laid on a long table in the front parlour room where a local doctor immediately performed major surgery on his abdomen (removing much of his intestines) that lasted all through the night. Somehow he survived the primitive conditions and made a full recovery and even later served in the army. Locals believe it was truly a “miracle” of the time. 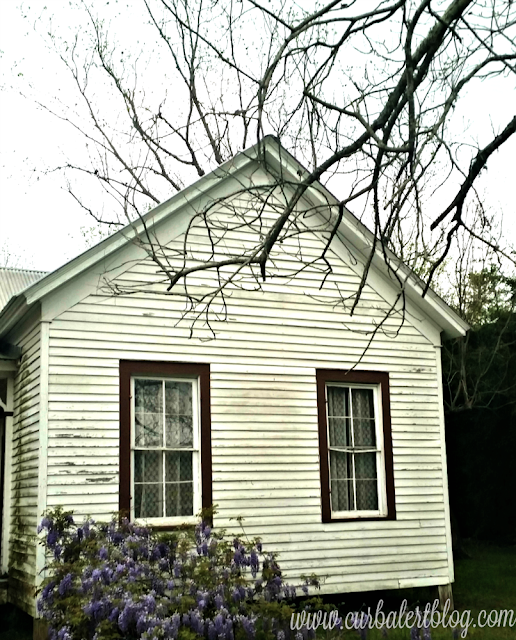 The farmhouse is now owned by the local Historical Society and has been abandoned for over two decades. It is also said to be haunted, which makes for some pretty interesting conversations amongst the children that attend the elementary school next door. One miracle that I notice every year is the beautiful wisteria bushes that adorn the front of the home and found it the perfect backdrop for my little Farmhouse Table Makeover. 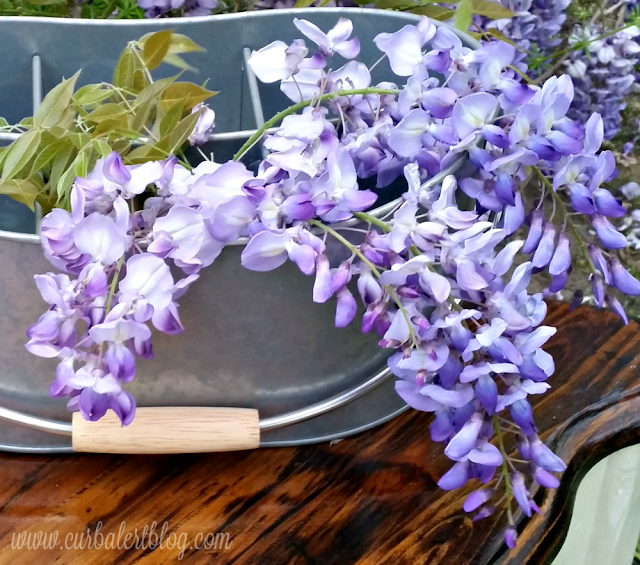 The wisteria smelled so lovely, making this the most enjoyable photoshoot I’ve attempted. I almost forgot how the little table looked in it’s earlier days (just imagine old 80’s orangey pine). 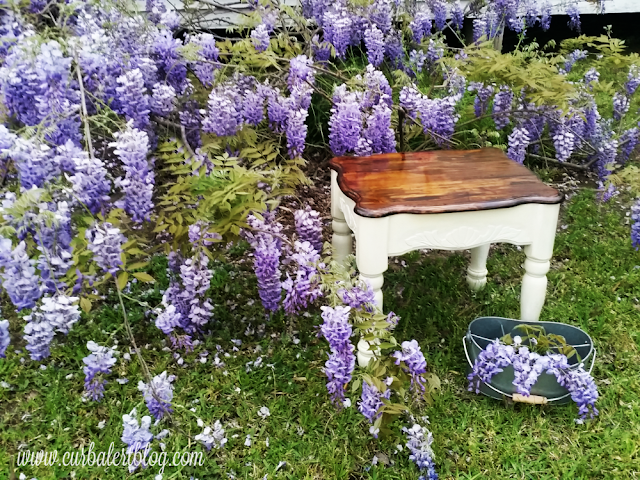 A few fresh coats of Annie Sloan Old White for the bottom and Minwax Dark Walnut for the table top transformed it into a cute new farmhouse feel. Here are a few “during” shots of the sanding process and the first coat of paint. I just wasn’t feeling the blue so changed it to white midway. Here’s an easy little painting tip… I love these tiny furniture risers called Painted Pyramid Stands. They really come in handy when trying to paint the feet of a smaller piece by lifting it up just enough to not get paint all over your work surface. Something so simple makes a big difference in my cleanup efforts. 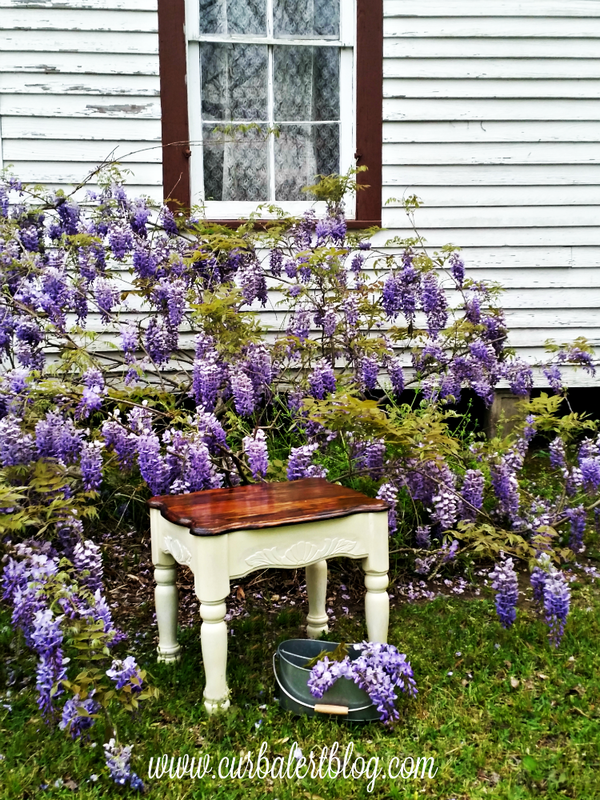 Now back to that beautiful wisteria adorning my little Farmhouse Table. I’ll have to stop by this home more often just to enjoy the scent (as long as there are no ghosts handing around!). I hope you enjoyed my little Farmhouse Tour and my Farmhouse Table Makeover. Please be sure and visit my other DIY Furniture Girlfriends to see their Farmhouse Interpretations. 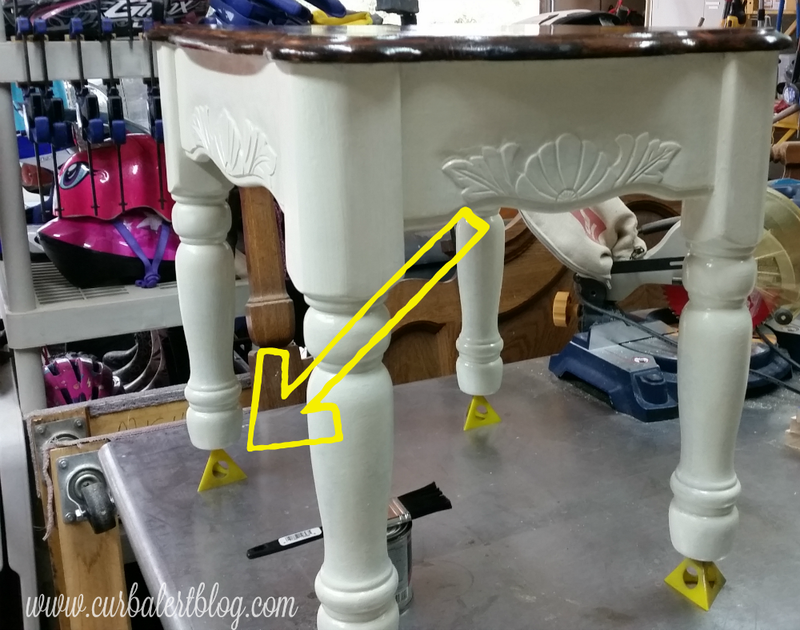 Previous ArticleEasy Furniture Painting Tip! What a gorgeous home, and you are absolutely right. That is a beautiful setting for your awesome makeover. How fun! Wow! 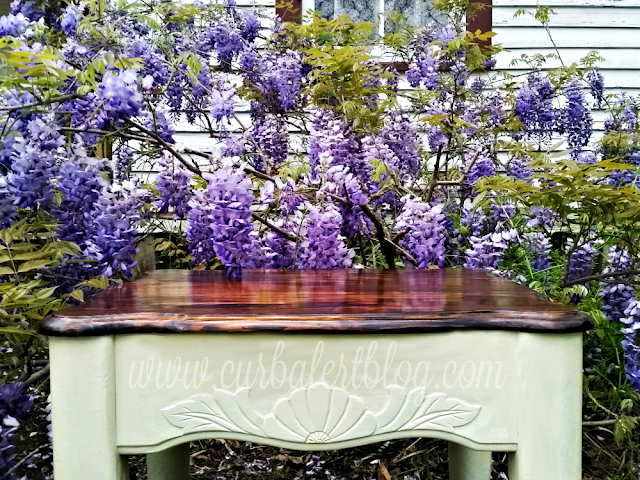 You are right, and amazing place to stage your gorgeous table. Love the transformation. Beautiful table and beautiful setting! I can almost smell the wisteria. 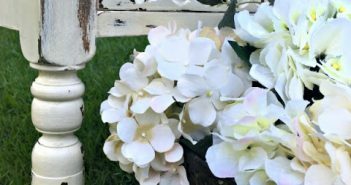 🙂 Love the combo of creamy white and dark stain, it is one of my favorites!! 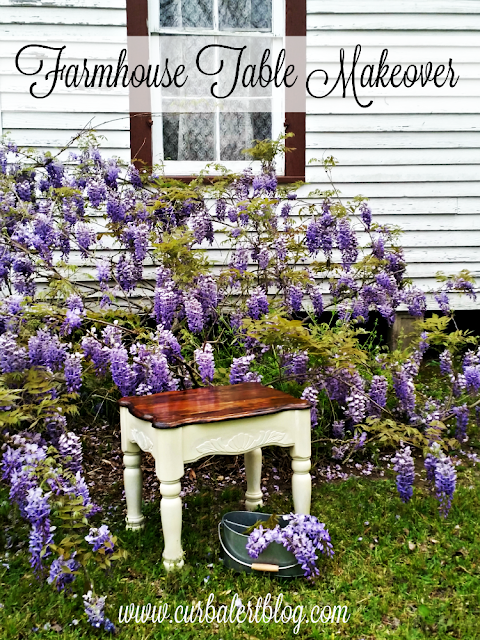 Such a beautiful house and the perfect setting for your cute farmhouse table! 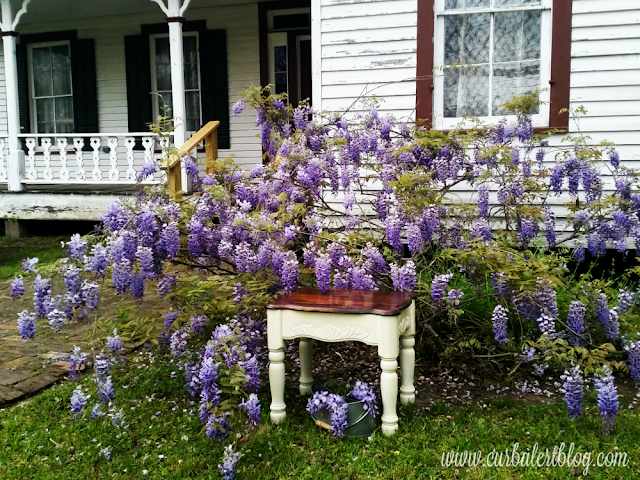 What a great story Tami and I'm swooning over the wisteria because here we are still buried in snow. 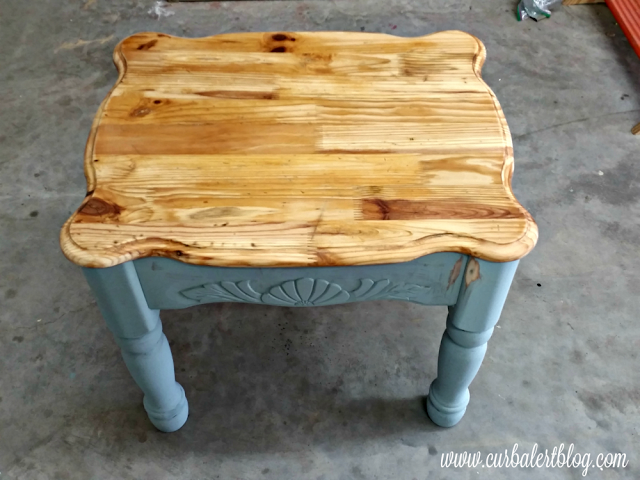 Love the character you gave this pine table! I have those painting pyramids and use them all the time for home decor pieces but never thought to use them for furniture – thanks for the tip! I love the history of the farmhouse. The Wisteria is a gorgeous backdrop. Your makeover is fabulous. I hope someone refurbishes the farmhouse and chases out the ghosts. Your farmhouse table dresses up the wisteria beautifully! What a great story and lovely table! This house is so awesome – you should buy it and make it your next project 😉 ghosts and all!!!! 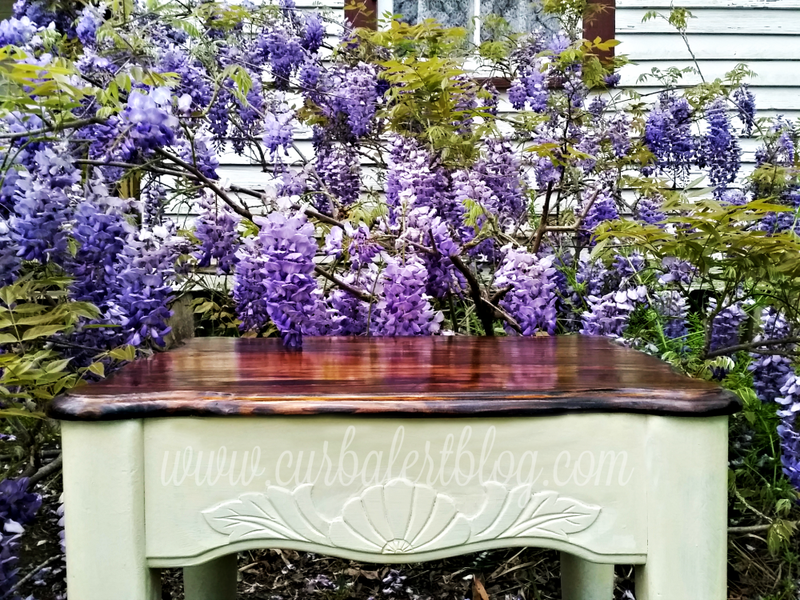 The Wisteria makes a lovely backdrop for you farmhouse table. I enjoyed the history that you shared, too. 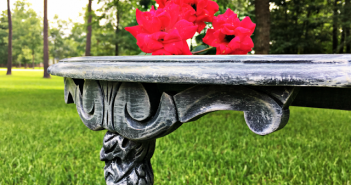 A simple update to the table and what a difference! Never heard of painters pyramids. Will have to add that to my list of to buys. 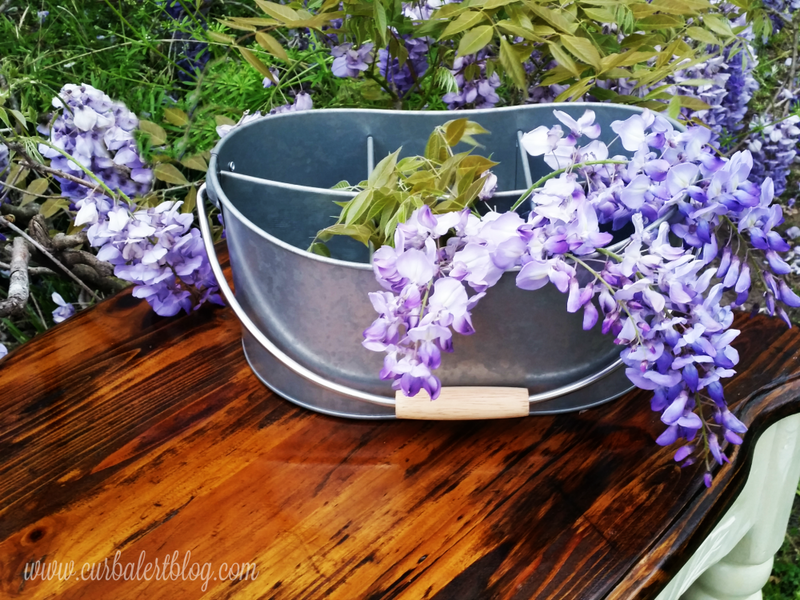 Thanks for stopping by the blog and Happy Easter! Such a cute little table and a perfect backdrop! You're so fortunate to pass by such lovely homes on a regular basis! What a beautiful farmhouse! 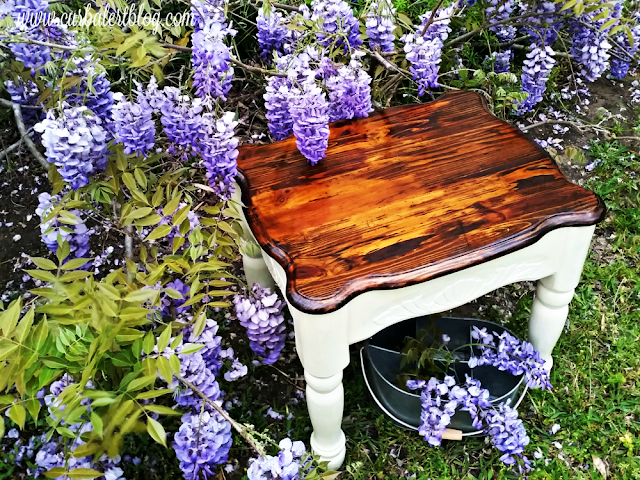 Love what you did with the table! Would you be willing to share that at our Link Party? I love this story. What a beautiful building and great farm table Tami.